So…I’m thinking of giving up on the constant ‘potentially…’ platform that is FourSquare. It’s been two years since the service came to the UK and I have been major of places I frequent on a daily basis as well as a few locations I will never visit again (including a couple of hotels and coffee shops in Helsinki!). Over the last year in particular I have found myself sticking up for the platform and telling all my friends (and some colleagues) to get with the programme. However, I have officially lost the will to defend the service any longer. I have spent the last month occasionally wondering whether or not I care about checking in here, there and everywhere. There is no real benefit to it, other than the competitive streak that drives me to be top of my contacts and mayor of my workplace, local train station, etc. The offers and local knowledge I was constantly waiting for FourSquare to incorporate are available from services like Groupon, so I don’t really see the benefit of the platform? While there are serious rumours that Groupon will be teaming up with FourSquare, it’s all just hearsay and too little too late for me, I’m afraid. 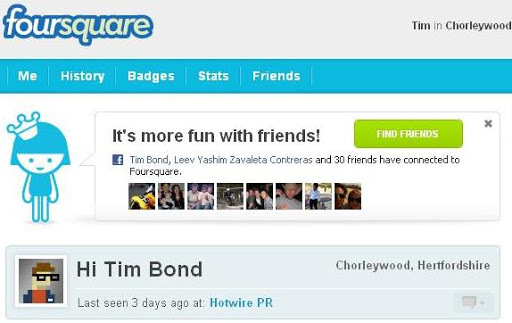 On Tuesday, when I started to mull over writing this blog post, I came to the conclusion that “My name is Tim and I am a FourSquare addict,” but more importantly that I don’t want to be anymore! In the interest of full disclosure I’m now 3 days clean and am posting after the initial withdrawal is over, which I won’t lie, was tough. But without FourSquare taking up the first minute of arriving anywhere, I find I have much more time to explore Twitter, try out new apps/services and keep on top of my news feeds for work, as well as my personal ones (for a change! ).